Special counsel Robert Mueller has been looking into a meeting between Trump’s and Putin’s allies as part of his larger investigation into Russian meddling in the 2016 election. 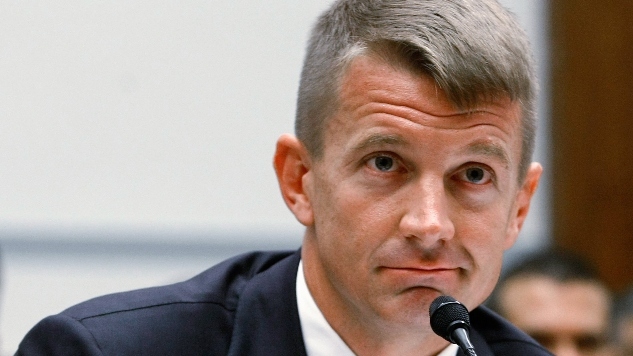 A little bit of backstory, in case you (somehow) forgot what we’re referencing: Erik Prince, former head of an American private military company, and Kirill Dmitriev, CEO of a Russian sovereign wealth fund, held a meeting just weeks before President Donald Trump’s inauguration. The twosome met on Jan. 11, 2017, at a hotel bar in Seychelles, East Africa. George Nader, a Lebanese-American businessman and advisor to the crown prince of the United Arab Emirates, was also present. Around a year after the meeting, Prince told the House Intelligence Committee that his chat with the Russian Direct Investment Fund (RDIF) CEO was unplanned and took place “over a beer.” Prince also said he did not attend as a representative of Trump. Since Prince’s testimony before Congress, Mueller’s team has received information that the meeting was a planned endeavor to set up a backchannel between the Trump administration and the Kremlin, according to The Washington Post. But this case of he said/he said might finally be resolved: A memo sent by Dmitriev after the meeting has now been found and reviewed. The two-page memo provides a summary of some of the ideas discussed in the Seychelles. The document lists four opportunities for cooperation and calls for an action plan to improve U.S.-Russian relations over the next year, as reported by The Daily Beast. The first bullet point advocates for the U.S. and Russia working together on “military coordination and joint actions in Syria against ISIS.” The plan was to set up a “joint special forces mission where together the U.S. and Russia take out a key ISIS person or place or frees an area then announces it after.” The document also proposes the countries share terrorism intelligence and implement a combined “large-scale humanitarian effort” to improve the quality of medical attention in rebel areas. Second, the memo proposes “a serious joint effort by U.S. and Russia to actively address the threat of nuclear, biological and chemical (WMD) terror.” While both Trump and Putin have expressed the desire to up their respective nuclear stockpiles, the memo suggests the two countries work together on nuclear nonproliferation. The document discusses the Nuclear Threat Initiative (NTI), which works to reduce the risk of nuclear attacks, as “one potential venue.” The Washington nonprofit has backed conversations between American and Russian diplomats throughout the years, and the company set up a bank to purchase uranium in the former Soviet republic of Kazakhstan. Third, the memo suggests that the U.S. and Russia develop “win-win economic investment initiatives” that both of their electorates would applaud. “Understanding U.S. production by foreign companies is a focus of the new administration,” the memo says, noting that Russian companies would “make investments with RDIF financing to serve the U.S. market in the Midwest, creating real jobs for hard hit area with high employment.” Translation: Russia proposed a way to help make Trump’s campaign promise of bringing back jobs to Midwestern towns come true. The document also suggests a “joint RDIF fund with OPIC [Overseas Private Investment Corporation] to support U.S. investment in Russia to make U.S. businesses competitive” in Russia, undeterred by subsidized Chinese business. Fourth, the memo says the U.S. and Russia should have an “honest and open and continual dialogue on differences and concerns.” One of the issues listed is resolving the Ukraine crisis, which began with Russia’s invasion and annexation of Crimea in 2014, through “ensuring Ukraine fulfills its commitments.” Sounds … vague. “They’re trying to do this through this weird backchannel,” remarked Evelyn Farkas, an Obama administration Pentagon official who focused on Eastern Europe and Russia, to The Daily Beast.